Get Ready to Cast Your Ballot! In October, SNA announced the slate of candidates who will stand for election to the SNA Board of Directors, Leadership Development Committee and Industry Advisory Council. While voting doesn’t begin until February 15, this is a great time to get to know the candidates and learn more about the new voting steps that will prepare you to participate in the election this year. This year, SNA members will be asked to vote for both the positions of President-Elect and Vice President, following the decision by the Delegate Assembly in July 2018 to reinstate the latter position in SNA’s governance structure. This will be the only year that both positions will be on the ballot. The January 2019 issue of School Nutrition features Q&A interviews with Sara Gasiorowski, SNS, and Reginald Ross, SNS, who are running for the position of President-Elect and Lori Adkins, SNS, and Beth Wallace, SNS, who are running for the position of Vice President (pages 20-21). Please note that Karen Castaneda has withdrawn from the ballot for the position of Northeast Regional Director for personal reasons. Warren DeShields, the other candidate for Northeast Regional Director, will run unopposed because it is too late in the election process to nominate a replacement candidate. Visit www.schoolnutrition.org/snaelection to access short biographies of the 14 other members who have stepped up to serve. An individual email address is required to cast a vote! When the election opens on the morning of February 15, you should look for an email sent from SNA’s election vendor, Election Services Corp. (ESC) on the Association’s behalf. 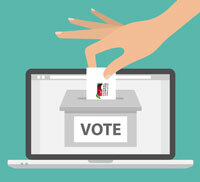 This email will provide steps for you to authenticate your identity and provide access to your ballot through a unique voting validation number. This number will be required to cast your vote. After voting, you will receive a “Thank You for Voting” email from ESC as confirmation. The process should be very simple and easy for most members eligible to vote. If you don’t receive this initial ESC email in your inbox on February 15, first check your “spam,” “clutter” and “other” folders. Some email systems divert select messages, even when they are from a known, approved source. Still can’t find this email? Don’t give up—there are some simple steps to get what you need to participate in this important election. Click on the red “Login to my account” button, visible at the top of SchoolNutrition.org. Check that your member profile includes an accurate, individual email address that is unique to you (or your family). If your email address was inaccurate or if you have now created a new, individual email address or if the information was correct but you still haven’t received the election email from ESC on February 15, please contact the ESC Help Desk, toll-free, at (866) 720-HELP (4357) or via email at snahelp@electionservicescorp.com, and a customer service representative will assist you. Please have your member ID number ready when calling or emailing the ESC Help Desk. The election voting will begin on February 15, 2019 and conclude on February 28, 2019. SNA needs your participation! Remember that voting is not just a right, but a responsibility that will shape the future of this organization.